Do You Know Who | St. Joseph Cupertino Fraternity - Theme for the Year "Living Our Charism Within Our Culture"
This Magdalen of the Franciscan Order came into the world in the year 1247 at Laviano near Cortona in the province of Tuscany. When she was 7 years old, she lost her pious mother. She was neglected by her careless father, who married again within a short time, and her unsympathetic stepmother was harsh with her, so that when Margaret was 18 years old, she left home to earn her bread among strangers. She was possessed of rare beauty, and ere long this became a snare for her. For the space of 9 years she gave herself up to a life of sin and scandal. Then one day she waited a long time in vain for her accomplice in sin to return home to the place where she lived with him. Presently his dog came to her whining and tugging at her dress. She followed the animal into the heart of the forest, and there she suddenly stood before the blood stained corpse of the unfortunate man; his enemies had murdered him. At the appalling sight, Margaret was stunned like one struck by lightening. Filled with terror she asked herself, “Where is his soul now?” Then and there she firmly resolved in the future to be even greater in penance than she had been in sin. Like the prodigal son she returned repentant to her native town of Laviano. In a penitential garb, her hair cut short, a cord around her neck, she knelt at the door of the church and publicly asked all the congregation to forgive the scandal she had given. Many people were edified at this public humiliation, but her stepmother was all the more embittered at it. She, as well as Margaret’s father, forbade her to enter the parental home again. This reception severely tempted Margaret to return to the road of vice, but God’s grace sustained her. Led by divine grace, she went to Cortona, made a contrite general confession to a Franciscan there, and submitted to the spiritual direction of her confessor. In a poor little hovel she now lived a secluded life, in penance, tears, and prayer, earning her scanty nourishment by hard manual labor. Again and again she begged for the habit of the Third Order, that she might be recognized by all the world as a penitent. But not until 3 years had elapsed and she had been severely tried, was her wish granted. She received the habit in 1277. Now her fervor increased, and it is almost incredible what rigorous penances she practiced from then on. Day and night she wept over her sins, and often sobs so choked her voice that she could not speak. Satan made use of every wile and snare to cause Margaret to relapse, but prayer, mortification, and humiliation successfully put him to flight. O God, who didst bring back Thy servant Margaret from the road of perdition to the way of salvation, grant in the same mercy, that we who once were not ashamed to follow her astray may now be glad to imitate her in penance. Through Christ our Lord. Amen. King St. Louis was born in the castle at Poissy near Paris on April 25, 1215. His devout mother, Blanche, was determined that he should be educated not only for the earthly kingdom he was to govern, but still more for the kingdom of heaven. She accustomed him to look upon all things in the light of faith, and thus laid the foundation for that humility in good fortune and endurance in misfortune which characterized the holy king. Louis was crowned king when he was only 12 years old. His mother, however, was entrusted with the actual government of the kingdom during his minority. Meanwhile, Louis was being educated in all the duties of a Christian prince. Among his instructors there were several Franciscan friars, and later on the young king himself joined the Third Order of St. Francis. Louis had governed his kingdom for several years in his own name, when he vowed, in the course of a serious illness, that if he would recover, he would make a crusade to the Holy Land, to wrest the holy places from the hands of the infidels. Upon regaining his health he at once carried out his vow. He took the fortress of Damietta from the Saracens, but was taken captive after his army had been weakened by an epidemic. After he had borne the sufferings of a prisoner of the infidels for several months with holy serenity, the terms for his release were submitted to him; but there was attached to these terms an oath, that if he did not fulfill them, he would deny Christ and the Christian religion. The holy king replied: “Such blasphemous words shall never cross my lips.” They threatened him with death. “Very well,” he said, “you may kill my body, but you will never kill my soul.” Filled with admiration at his steadfast courage, they finally released him without objectionable condition. After securing many other terms favorable to the Christians, he was obliged to return to France, his mother had died in the meantime. In the government of his kingdom, Louis proved how profitable piety is in every respect. He promoted the welfare of the country and his people in a remarkable manner. His life as a Christian and as a Christian father was so exemplary that he has been found worthy to be chosen as the patron and model of Tertiaries. The most important principal of his life was the observance of the laws of God under all circumstances. His biographer assures us that he never lost his baptismal innocence by mortal sin. He himself set such store by the grace of baptism that, in confidential letters, he took pleasure in signing himself “Louis of Poissy,” because it was in the parish church there that he had been baptized. Louis never tolerated cursing or sinful conversation either among the servants or among the courtiers; and never was he heard to utter an unkind or impatient word. He wished to avoid all unnecessary pomp and luxury at court, so that more help could be rendered to the poor, of whom he personally fed and served several hundred. His wardrobe was as simple as it could fittingly be, and at all times he wore the insignia of the Third Order under his outer garments. On special occasions he publicly wore the habit of the Tertiaries. In order to curb sensuality he not only observed all the fasts of the Church with unusual severity, but denied himself certain food for which he had a special craving. He was a most solicitous father to the 11 children with which God blessed his marriage. He himself prayed with them daily, examined them in the lessons they had learned, guided them in the performance of the works of Christian charity. Amid exclamations of holy joy because he was going into the house of the Lord, he surrendered his soul to God on August 25. St. Louis was canonized by Pope Boniface VIII in 1297. Blessed Amatus was a thirteenth-century Tertiary who rose to great heights of sanctity by serving God as a hermit, as a pilgrim and as a nurse. Born at Sldezzo, near Rimini, about 1238, he lost his parents while still very young, and was brought up by a relative. 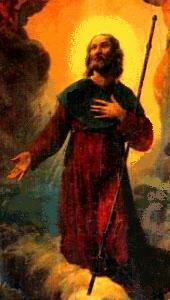 He was then urged to get married, but he felt that God called him to a life of prayer and penance. After joining the Third Order of St Francis, he fled to a solitary place and began to live as a hermit. By many he was considered a fool, but God showed how much He was pleased with the virtuous life of Amatus by marvelous signs. A mysterious light was seen shining over the hut which served as his shelter, and heavenly songs were heard to issue from it. “O Death, how bitter is the remembrance of Thee to the man who has peace in his possessions!” Also mere attachment to material things without their having enjoyed them may at times fill people with fear at the thought of being separated from them by death. True Christian are mindful of those other treasures which we cannot lose in death and which constitute real comfort in that hour. On October 9th, in response to numerous appeals to the Holy See by Bishops and Ministers General of the Franciscan Family, Pope Francis declared Blessed Angela de Foligno of Italy a saint. Born in Umbria in 1248, the mystical writer, after experiencing a stunning conversion, wrote of her experiences and visions, recorded in her Book of Visions and Instructions. This is a canonization that is equal in force and significance. It was Pope Francis’ desire to declare her a saint on October 9th, without the necessity of having a public ceremony for her canonization. The Congregation for the Causes of Saints released this announcement on Friday, October 11th. The Holy Father after having received in audience Cardinal Angelo Amato S.D.B., prefect of the Congregation for the Causes of Saints, extended the liturgical cult of Blessed Angela of Foligno of the Secular Franciscan Order, born in Foligno (Italy) in 1248 and dying in the same place in 1309, to the universal Church, inscribing her in the catalogue of saints. 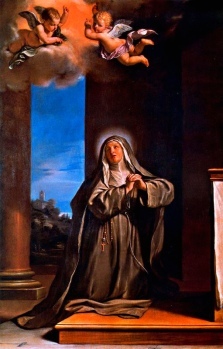 Saint Angela of Foligno is a Secular Franciscan. She is our sister, a lay woman, and a mother in the fullest sense. She is a mother of the children born of her womb and prematurely lost, a mother of the disinherited for whom she sold her earthly possessions, and a mother to her spiritual sons and daughters who remained at her side till the end of her life. The life of Saint Angela began with a worldly existence, rather remote from God. But, later, her encounter with the figure of St Francis and, finally, her encounter with the crucified Christ, reawakened her soul; it is only with God that life becomes true life, because, in sorrow for sin, it becomes love and joy. This is how Saint Angela also speaks to us. “Without heavenly light, no man can be saved….if you wish to gain possession of this light, pray…; if you wish to increase this light within you, pray; if you want faith, pray; if you want hope, pray; if you want charity, pray; if you want poverty, pray; if you want true obedience, pray; if you want chastity, pray; for whatever the virtue you seek, pray. And pray in this way: by reading in the Book of Life, that is, in the life of the One who is God and man, Jesus Christ” (Instruction II, lines 229 ss.). Pope Benedict XIV called Saint Angela the “Mistress of Theologians”, because all doctrine has been developed on the Book of Life, Jesus Christ, our Lord. The Holy Father, Benedict XVI. has canonized Anna Schaffer, a secular Franciscan, in the Holy Mass celebrated on the St. Peter’s square in Rome, on October 21st. In whatever form, suffering seems to be, and is, almost inseparable from man’s earthly existence… Human suffering evokes compassion;it also evokes respect,and in its own way it intimidates.For in suffering is contained the greatness of a specific mystery… Down through the centuries and generations it has been seen that in suffering there is concealeda particular power that draws a person interiorly close to Christ,a special grace. To this grace many saints, such as Saint Francis of Assisi, Saint Ignatius of Loyola and others, owe their profound conversion. A result of such a conversion is not only that the individual discovers the salvific meaning of suffering but above all that he becomes a completely new person (Apostolic Letter Salvifici doloris, SD, John Paul II, February 11, 1984 nos. 3, 4, 26). The life of Holy Anna Schäffer singularly illustrates this observation by the Holy Father. Anna Schäffer was born in Mindelstetten, a village in Lower Bavaria in the diocese of Regensburg, in southern Germany, on February 18, 1882, into a large family, the father of which worked as a joiner. The Schäffers were good Christians. Faithful to their morning, midday, and evening prayers, they went to church every Sunday and feast day, but also during the week when possible. Anna was a quiet, gentle, and shy child, a gifted student and skillful at manual work. In 1896, her father died at the age of forty, leaving the family in terrible poverty. Anna, who wished to become a nun, and in a missionary congregation if possible, had to work so as to build up her dowry (a financial contribution one had to make at that time in order to enter a convent.) When she was fourteen, she started working as a gofer, first in Regensburg at a pharmacy, then in Landshut in the office of a councilor to the magistrates’ court. There, one night in June 1898, she received a message from Heaven for the first time—a Saint appeared to her (she did not know his name) and told her, Before you turn twenty, you will begin to suffer a great deal. Say the Rosary. She would later speak of dangers to her virginal purity that she was able to overcome during these years, thanks to the Holy Rosary. The evening of February 4, 1901, the young woman, working at the forester house in Stammham, was doing the laundry with a female companion, Wally Kreuzer. The stove pipe that went above the boiler became detached from the wall. To repair it, Anna climbed on a low wall jutting out. Suddenly, she lost her balance and fell up to her knees in the boiling laundry water. Panic-stricken, Wally, instead of helping her companion, went running for help. A coachman ran up and pulled the injured girl from the boiler. She was taken in a cart to the nearest hospital, seven kilometers away. At eleven o’clock that night, she was finally seen to by a doctor who operated on her for two hours. The weeks that followed were terrible—it was necessary to constantly cut away pieces of gangrenous flesh. Three months later, the medical insurance Anna was under stopped paying coverage. Mrs. Schäffer could not take on responsibility for hospitalization, and so had to bring her poor child back home. Upon Doctor Wäldin’s entreaties, an institution for invalids took care of the sick girl. Anna would be hospitalized at the clinic at the University of Erlangen (close to Nuremberg) from August 1901 till May 1902. Yet the treatments did not have any effect. Upon her return home, Anna was competently cared for by Dr. Wäldin. This doctor tried in vain to perform skin grafts through over thirty operations. Since he was unable to bring the sick girl relief, he finally resigned himself to wrapping her legs in sterile bandages. For the remaining twenty years of Anna’s life, care would be limited to the weekly changing of these dressings. Anna Schäffer’s plan to enter religious life was unfeasible from that point on. The young woman did not resign herself to her fate without difficulty—she complained of her suffering and clinged to the hope of being cured. Nevertheless, her soul matured in the difficult school of the Cross. The parish priest in Mindelstetten, Father Rieger, who would be her spiritual father, was to testify that he had never heard a word of complaint fall from her lips. In her constant suffering, Anna was strengthened and consoled by the living God and especially by the Holy Eucharist. People react to suffering in different ways wrote Pope John Paul II. But in general it can be said that almost always the individual enters suffering with a typically human protestand with the question ‘why?’He asks the meaning of his suffering and seeks an answer to this question on the human level. Certainly he often puts this question to God, and to Christ. Furthermore, he cannot help noticing that the One to whom he puts the question is Himself suffering and wishes to answer himfrom the Cross, from the heart of His own suffering. Nevertheless, it often takes time, even a long time, for this answer to begin to be interiorly perceived… Christ does not explain in the abstract the reasons for suffering, but before all else He says: ‘Follow me! Come! Take part through your suffering in this work of saving the world, a salvation achieved through my suffering! Through my Cross.’ Gradually, as the individual takes up his cross, spiritually uniting himself to the Cross of Christ, the salvific meaning of suffering is revealed before him» (SD, no. 26). From 1910 to 1925, Anna Schäffer wrote her thoughts in twelve notebooks. One hundred eighty-three of her letters or notes are also intact. Her language is quite simple, yet the originality and personal character of her writings strike the reader, who discovers in them a soul firmly established in faith in Jesus Christ dead and resurrected, and in the living Communion with all God’s elect. This unfailing confidence in God, this certainty in His infinite love manifesting itself to her through her sufferings, shone on those who approached her to entrust to her their intentions or to ask her for encouragement or advice. These visitors, at first just a handful, slowly grew in number. Those who were the most prejudiced against Anna did not fail to be impressed by her patience and her kindness. Her brother Michael, a poor soul who took to drink, was not the last when he drank to mock the Saint. Anna took her «revenge by making a point of converting him with gentleness. Nevertheless, Michael’s behavior forced Mrs. Schäffer to rent a little apartment in the village to move into with her daughter. Anna wrote to this admirable mother who assisted her daughter until her death and whom she would outlive four years, Oh my dear mother, what a grace it is to have you constantly by my side! Our dear Lord sends His children help in the hour of need, when we ask it of Him in confidence, and it is often when a trial or affliction most overwhelms us that He is closest to us with His help and His blessing. Accessible by an extremely steep staircase, the only decorations in the sick woman’s room were a crucifix, an Ecce Homo, and pictures of saints. Anna hardly left her room and her bed (which she also called her bed-cross.) On rare occasions, she was brought to church in an armchair. As soon as Pope Saint Pius X permitted daily communion, Father Rieger brought her the Eucharist every day, from which she drew her strength. Anna did not care much for being famous. Her days passed in prayer, manual labor and writing. I have three keys to heaven, she said. The biggest is made out of pig iron and is heavy—it is my suffering. The second is the sewing needle, and the third is the penholder. With these different keys, I strive each day to open the door to Heaven. Each of them must be decorated with three little crosses, which are prayer, sacrifice, and selflessness. Often, the children in the village came to visit Anna. They were attracted to her. The sick woman spoke to them about the Savior, the Blessed Virgin, and the saints. She explained to them how people go to Heaven. The whole town of Mindelstetten was by and large sympathetic towards her. People loved her and pitied her, and sought to please her. On feast days, a delegation from the village came to visit her; sometimes the whole village band offered her a serenade while passing under her window. It was charity towards her neighbor who was also suffering that brought Anna out of her usual silence. As soon as she saw a person experiencing difficulty, she found a thousand cheery and friendly words to comfort him or her, and seemed herself to be the happiest of creatures. She treasured all the prayer intentions that were entrusted to her, and presented them tirelessly to God. All of Anna’s writings give evidence of a profound submission to Divine Providence and a joyous acceptance of crosses. Quite often, her letters bear a little pen and ink illumination in two or three colors, representing the Cross, a chalice surrounded with thorns, or some other scene from the Passion. Dear Fanny, she wrote to a friend on December 14, 1918, we must consider our sufferings to be our dearest friends who wish to accompany us constantly, day and night, to remind us to look on high, to the Holy Cross of Christ. Christ suffers voluntarily and suffers innocently… Human suffering has reached its culmination in the Passion of Christ. And at the same time it has entered into a completely new dimension and a new order: it has been linked to love, … to that love which creates good, drawing it out by means of suffering, just as the supreme good of the Redemption of the world was drawn from the Cross of Christ…In [the Cross of Christ] we must also pose anew the question about the meaning of suffering, and read in it, to its very depths, the answer to this question» (SD, nos. 10, 11, 13, 14, 18). Anna had been a member of the Secular Franciscan Order for a long time. Beginning on October 4, 1910, the feast of St. Francis, she bore the stigmata of the Passion for a time, but she begged God to make these mystical wounds in apparent, which was granted her. It does not seem that she read Holy Scripture a great deal, but as a daughter of the Catholic Church, she laid claim to its doctrine and liturgy, which she went over in the course of the year with the help of her childhood memories. To pray for the holy Church and her pastors is the most important thing for me, she affirmed. She understood her life as an invalid as a participation in the Cross of Christ. In the hours of suffering and in the many sleepless nights, I have the wonderful opportunity to place myself in spirit before the tabernacle and to offer expiation and reparation to the Sacred Heart of Jesus. Oh, how quickly the time goes by for me then! Sacred Heart of Jesus, hidden in the Blessed Sacrament, I thank You for my cross and my sufferings, in union with the thanksgivings of Mary, the Mother of Sorrows. The Redeemer suffered in place of man and for man… Each one is also called to share in that sufferingthrough which the Redemption was accomplished… In bringing about the Redemption through suffering, Christ hasalso raised human suffering to the level of the Redemption.Thus each man, in his suffering, can also become a sharer in the redemptive suffering of Christ…Whoever suffers in union with Christ completes what is lacking in Christ’s afflictions (Col. 1:24)…The sufferings of Christ created the good of the world’s Redemption. This good in itself is inexhaustible and infinite. No man can add anything to it. But at the same time, in the mystery of the Church as His Body, Christ has in a sense opened His own redemptive suffering to all human suffering… This Redemption lives and develops as the Body of Christ, the Church, and in this dimension every human suffering, by reason of the loving union with Christ, completes the suffering of Christ. It completes that suffering just as the Church completes the redemptive work of Christ» (SD, nos. 19, 24). Our Lord Jesus Christ, the Blessed Virgin and the Saints spoke frequently to Anna in her dreams at night, and these messages from Heaven were for her a refreshment and a foretaste of Paradise. But these consolations never gave her a superhuman impassiveness. Until the very end, she accepted with gratitude the limited relief that medicine brought her. Over the course of the twenty-five years of her martyrdom, she improved in the interior acceptance of her trials. She gradually discovered the secret of interior peace, which she thus expressed in her quite simple language: Oh! What happiness and what love are hidden in the cross and suffering!… I do not spend fifteen minutes without suffering, and for some time I have not known what it is to be without pain… I often suffer so much that I can hardly say a word—when this happens, I think that my Father of the Heavens must particularly love me. As in the words of Saint Paul: I am overflowing with joy all the more because of all our affliction (2 Cor. 7:4), she suffered with a mysterious, subtle joy. A source of joy is found in the overcoming of the sense of the uselessness of suffering… This feeling not only consumes the person interiorly, but seems to make him a burden to others. The person feels condemned to receive help and assistance from others and at the same time seems useless to himself. The discovery of the salvific meaning of suffering in union with Christ transformsthis depressing feeling… In the spiritual dimension of the work of Redemption the person who is suffering is serving, like Christ, the salvation of his brothers and sisters. Therefore he is carrying out an irreplaceable service… Those who share in the sufferings of Christ preserve in their own sufferings a very special particle of theinfinite treasureof the world’s Redemption, and can share this treasure with others (SD, no. 27). Three and a half years before her death, Anna had to stop her sewing work, which provided her relaxation and an opportunity to be useful. In addition, it became absolutely impossible to carry her to the neighboring parish church to attend Mass, and this renunciation was very painful for her. She wrote, My life is fading away little by little in suffering… Eternity is ever approaching. Soon, I will live from God, Who is Life itself. Heaven has no price, and I rejoice every minute in the Lord’s call to the infinitely beautiful homeland (March 16, 1922). On October 5, 1925, after having received Holy Communion and made the sign of the cross, murmuring, Lord Jesus, I love You, Anna Schäffer died peacefully, at the age of 43. Her body lies in the cemetery in Mindelstetten, awaiting the «resurrection of the flesh, (cf. Catechism of the Catholic Church, 988-1019). Christ has overcome the world definitively by His Resurrection. Yet, because of the relationship between the Resurrection and His Passion and Death, He has at the same time overcome the world by His suffering. Yes, suffering has been singularly present in that victory over the world which was manifested in the Resurrection. Christ retains in His risen body the marks of the wounds of the Cross in His hands, feet and side. Through the Resurrection, He manifests the victorious power of suffering» (SD, no. 25). The power of suffering is also left to men and women so as to bring about the civilization of love: The first and second parts of Christ’s words about the Final Judgment (Mt. 25:34-45) unambiguously show how essential it is, for the eternal life of every individual, to ‘stop,’ as the Good Samaritan did, at the suffering of one’s neighbor, to have ‘compassion’ for that suffering, and to give some help. In the messianic program of Christ, which is at the same time the program of the Kingdom of God,suffering is present in the world in order to release love, in order to give birth to works of love towards neighbor, in order to transform the whole of human civilization into a ‘civilization of love.’ In this love the salvific meaning of suffering is completely accomplished and reaches its definitive dimension» (SD, no. 30). The Pope thus concludes his apostolic exhortation: «And we ask all you who sufferto support us. We ask precisely you who are weak to become a source of strengthfor the Church and humanity. In the terrible battle between the forces of good and evil, revealed to our eyes by our modern world, may your suffering in union with the Cross of Christ be victorious! (SD, no.31). Anna Schäffer was victorious thanks to Jesus’ Cross. Even before the official judgment of the Church, a number of people in Bavaria, then throughout Europe, came to her grave to beseech her help. In 1998, 551 graces obtained through her intercession were registered with the parish in Mindelstetten. Since 1929, more than 15,000 graces attributed to her prayer have been reported. During her beatification on March 7, 1999, the Pope John Paul II said, If we look to Blessed Anna Schäffer, we read in her life a living commentary on what Saint Paul wrote to the Romans: Hope does not disappoint, because the love of God has been poured out into our hearts through the Holy Spirit that has been given to us (Rom. 5:5). She most certainly was not spared the struggle to abandon herself to the will of God. But she was given to grow in the correct understanding that weakness and suffering are the pages on which God writes His Gospel… Her sickbed became the cradle of an apostolate that extended to the whole world.